This was one that was well worth the money! We got the whole day themed one so there was no rush as it takes a while to even choose a style that you like and then you have to line up to get changed and get additional accessories (most at extra affordable costs). Make sure you go there early as soon as they open as it gets really busy after 10am when all the buses filled with tourists come. 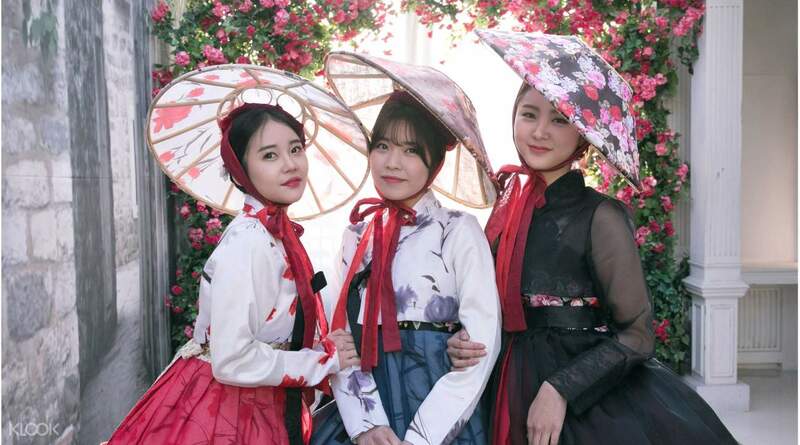 Live out your favorite historical K-drama fantasy and get decked out in a traditional Korean hanbok! 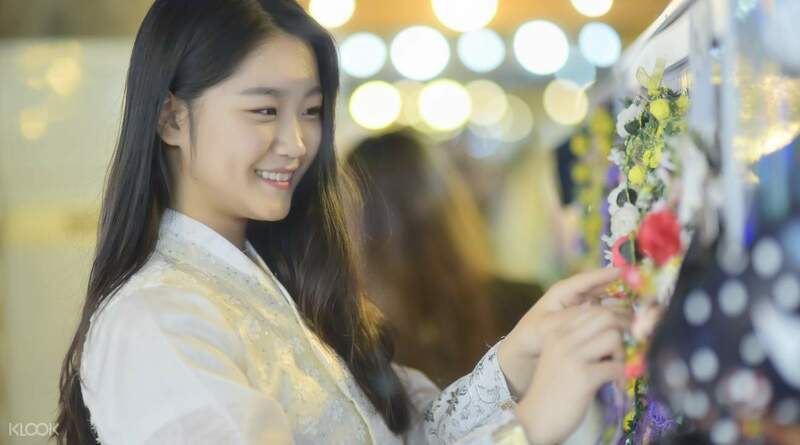 Characterized by vibrant colors and simple lines without pockets, the hanbok refers to clothing of the Joseon period, commonly worn as semi-formal or formal wear during festivals and celebrations. Most contemporary Koreans only wear it on special occasions such as holidays and weddings. 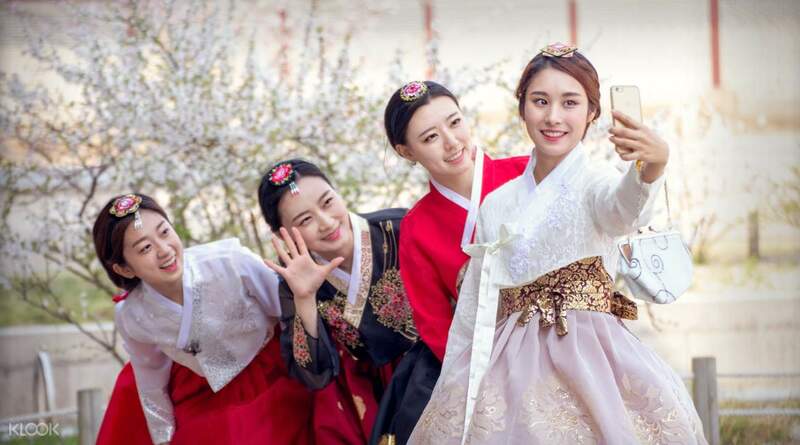 But in recent years, photos of young people posing in hanbok have flooded social media and tourists are jumping on this trend! Simply use this voucher when you visit the Kyeonbokgung Store in Hanboknam to get access to over 500 hanboks and pick out the best one that will suit your style. You can step back in time and choose a royal or military attire from the imperial era. 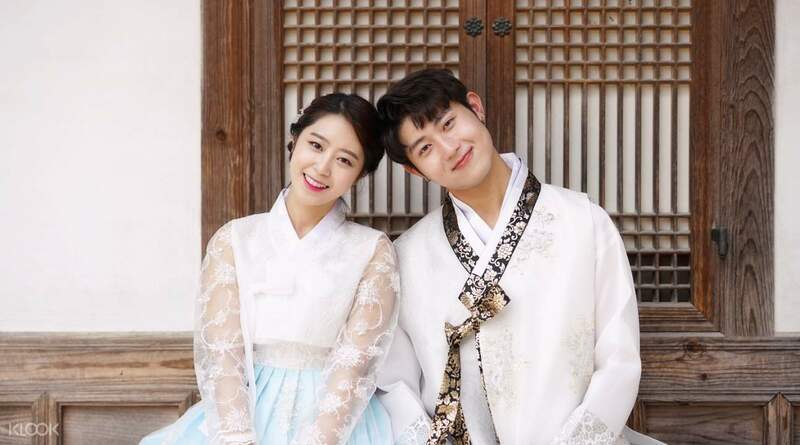 If you are visiting Korea with your significant other, try wedding-themed hanboks just for fun. You can also rent additional accessories like the daenggi to give a nice highlight to your braided hair. Take as many photos as you want in the "self studios" where you can choose from the many film and TV show-themed sets. Choose among over 100 pairs and 500 pieces for your winter outfit! All the personal information collected by Hanboknam will be only used for this event and will be handled by Hanboknam after the event, will be deleted after the whole event ended. A must when you go to Seoul! Hanboknam staff were very friendly and assisted us well. I prebooked Traditional hanboks (wholeday) for me and my husband but I suggest you get the Character hanboks because it has more designs/options to choose from. A must when you go to Seoul! Hanboknam staff were very friendly and assisted us well. I prebooked Traditional hanboks (wholeday) for me and my husband but I suggest you get the Character hanboks because it has more designs/options to choose from. When you go find the building, which has cafe on the bottom, the entrance is on the right side and you go down some stairs. You’ll find a mess of people with a counter. I’m not sure where the queue is but you essentially go to the counter and show your Klook voucher, give id, and they give you key for locker. After getting rid of outer garments, you head upstairs. I got traditional hanbok. I don’t think size matters when you’re short. I picked out skirt then top. You then queue closer to window to try on the garments. They’ll give you the hoop under skirt when you go into dressing room. They will help tie your hanbok if you cannot do it yourself. Because I’m short, they gathered the skirt so I wasn’t stepping on it all the time. It looked fancy. After that you get your hair done. You can put a headband on if you like. When you are done, you go back downstairs to the counter, go on the right side. There they give you wristband with what time to return. My time started when I was dressed so I could’ve gotten the 2.5 hour instead of 4 hour. I returned before my 4 hours was up because I was cold. I should have brought my overcoat. I had good fun and would do this again when I’m in Seoul! When you go find the building, which has cafe on the bottom, the entrance is on the right side and you go down some stairs. You’ll find a mess of people with a counter. I’m not sure where the queue is but you essentially go to the counter and show your Klook voucher, give id, and they give you key for locker. After getting rid of outer garments, you head upstairs. I got traditional hanbok. I don’t think size matters when you’re short. I picked out skirt then top. You then queue closer to window to try on the garments. They’ll give you the hoop under skirt when you go into dressing room. They will help tie your hanbok if you cannot do it yourself. Because I’m short, they gathered the skirt so I wasn’t stepping on it all the time. It looked fancy. After that you get your hair done. You can put a headband on if you like. When you are done, you go back downstairs to the counter, go on the right side. There they give you wristband with what time to return. My time started when I was dressed so I could’ve gotten the 2.5 hour instead of 4 hour. I returned before my 4 hours was up because I was cold. I should have brought my overcoat. I had good fun and would do this again when I’m in Seoul! The Hanbok Rental was at first difficult to find the shop but we manage to find it. The staff was friendly in helping us on how to dress up and also we were able to enter the palace for free as we were wearing Hanbok. The Hanbok Rental was at first difficult to find the shop but we manage to find it. The staff was friendly in helping us on how to dress up and also we were able to enter the palace for free as we were wearing Hanbok. venue is easy to find, just opposite the cat cafe! klook voucher is really much cheaper! i suggest you dont purchase first, when we reached, tell the recep you wana pay via klook, they will tell u to handover passport for them to keep, and they will give u locker keys to keep your stuffs and proceed to 2nd level to choose ur handboks. initially i didnt know whats traditional/themed hanboks. basically traditional are more plain with single color dress. themed dress has more floral designs and more selections to choose. when we reached its ard 2pm. so many ppl, we have no idea how to choose and match but i managed to ask the staff for help! some staff are really friendly but got 1 very rude. the dress selections are many and basically u just have to mix and match yourself! the ppl there will come and help u tie nicely. after i had my hairdo done Its already past 3+pm. So we click on klook to book the 4hrs themed hanbok. Its so much cheaper at $62 for 2 pax. But if u were to pay over counter, its 40000 won for each person excluding hairdo and accessories. So klook is really gd! Then we proceed to walk to the palace ard 10min will reach.., we only walked like till 4.30pm and the palace ppl start to chase us out saying they close at 5pm! Oh well i tot it close at 6pm but nonetheless we are all freezingly cold so forget it la.. I have taken enough pics for 1hr! So end up we returned the hanbok at 5.30pm and proceed to have a dessert at e cafe downstairs! The cafe serves delicious tiramisu and green tea latte! overall i quite like the hanbok designs and the services! gd choice! venue is easy to find, just opposite the cat cafe! klook voucher is really much cheaper! i suggest you dont purchase first, when we reached, tell the recep you wana pay via klook, they will tell u to handover passport for them to keep, and they will give u locker keys to keep your stuffs and proceed to 2nd level to choose ur handboks. initially i didnt know whats traditional/themed hanboks. basically traditional are more plain with single color dress. themed dress has more floral designs and more selections to choose. when we reached its ard 2pm. so many ppl, we have no idea how to choose and match but i managed to ask the staff for help! some staff are really friendly but got 1 very rude. the dress selections are many and basically u just have to mix and match yourself! the ppl there will come and help u tie nicely. after i had my hairdo done Its already past 3+pm. So we click on klook to book the 4hrs themed hanbok. Its so much cheaper at $62 for 2 pax. But if u were to pay over counter, its 40000 won for each person excluding hairdo and accessories. So klook is really gd! Then we proceed to walk to the palace ard 10min will reach.., we only walked like till 4.30pm and the palace ppl start to chase us out saying they close at 5pm! Oh well i tot it close at 6pm but nonetheless we are all freezingly cold so forget it la.. I have taken enough pics for 1hr! So end up we returned the hanbok at 5.30pm and proceed to have a dessert at e cafe downstairs! The cafe serves delicious tiramisu and green tea latte! overall i quite like the hanbok designs and the services! gd choice! We all enjoyed this so much! The hanboks are so pretty - my little girl and I felt like princesses in them. Hanboknam was easy to find, and staff was friendly and helpful. This is definitely a must do when you visit Seoul. We all enjoyed this so much! The hanboks are so pretty - my little girl and I felt like princesses in them. Hanboknam was easy to find, and staff was friendly and helpful. This is definitely a must do when you visit Seoul. It was easy to find just follow the map and take note the building name has changed. i think its name changed to a coffee shop but you can clearly see the hanbok clothes at the second floor. the main door to the place is at the right leading you to the basement. we arrived around 9am and we were the 1st one to be served. So many choices. Me and my group chose the traditional hanbok but i changed mine to character since i wanted to dress up as a prince. It was easy to find just follow the map and take note the building name has changed. i think its name changed to a coffee shop but you can clearly see the hanbok clothes at the second floor. the main door to the place is at the right leading you to the basement. we arrived around 9am and we were the 1st one to be served. So many choices. Me and my group chose the traditional hanbok but i changed mine to character since i wanted to dress up as a prince.